We’ve encountered a lull when it comes to Tolkien. Sure, the 80th anniversary of the 1937 publication of The Hobbit is around the corner, but Peter Jackson’s beloved initial trilogy and then that “initially excited until you heard it was going to be stretched into three movies” thing that happened to The Hobbit seems to have exhausted the cinematic currency of fantasy’s most influential series for now. 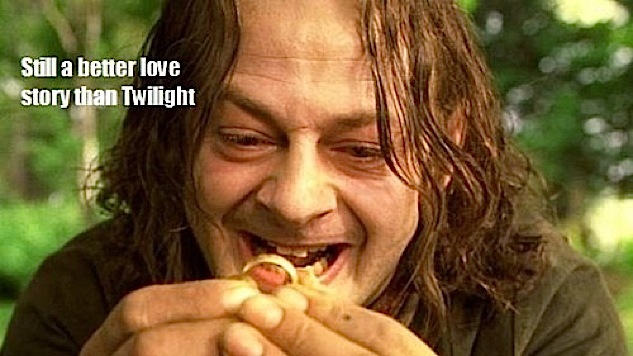 No worries, though—this week is Tolkien week, and that’s as good a time as any to recognize the hard work of the meme-tariot as it produces memes and meme-lets that themselves have become influential and inevitable glosses on existing and new pieces of pop culture ephemera. (Between Boromir and Ned Stark, Sean Bean is pretty much the King of Meme Generator … I hope that guy gets royalties.) So, with that in mind, let’s take a trip through the meme-ified remains of ol’ J.R.R.